In the InLoox options, the InLoox administrator can change the structure of the Kanban board for the entire project platform, manage task templates and set the update interval in InLoox. The InLoox Administrator can change the structure and the appearance of the Kanban board in the InLoox options. This will open the Options dialog. 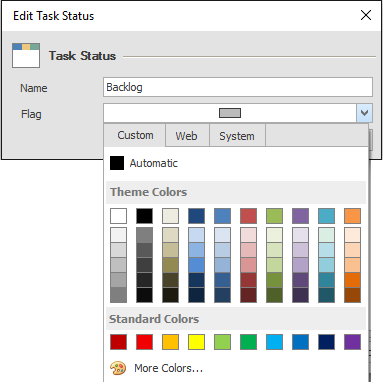 Click in the navigation pane on the left on Tasks, Task Statuses. In the section on the right, you’ll see all the names and the assigned colors of the current columns of the Kanban board that apply to all of your projects in your database. By default, your Kanban board contains three columns with the statuses To Do, In Progress, Done. You can now edit the existing columns by changing their name, assigning another color or changing the order of the columns on the board. Click on the status that you want to edit. To change the order of the Kanban columns, move the column to the desired position by using the arrow buttons (dthe top status equals the column on the far left, the bottom status equals the column on the far right). 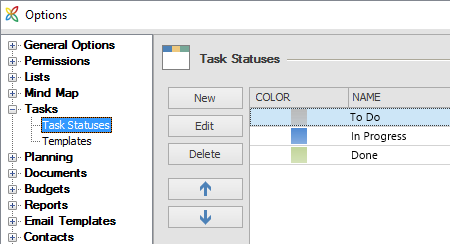 To change to assigned color or the name of the column, click on the status that you want to change, then click on Edit. Make all of your changes, then click on OK.
to position the status on your Kanban board. When you have made all of your changes to the Kanban board, click on OK in the Options dialog. The changes now apply to the entire project platform. 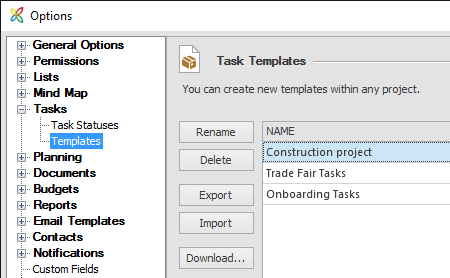 You can create, save and export task templates in every project. The InLoox Administrator can rename, delete, export and import existing templates in the InLoox options for the entire project platform. In Outlook, click on the File tab, then on Options under InLoox. This will open the Options dialog. Click in the navigation pane on the left on Tasks, Templates. Now you will see all task templates that are currently available on your InLoox database in the section on the right. To rename a task template, click on the name of the template, then on Rename. You can enter a new name and confirm with OK.
To remove a task template permanently from the database and from all InLoox projects, mark the template, then click on Delete. To export an existing template in order to save it on your computer or file server, mark the template and click on Export. Now you can save the template. You can also import task templates from your computer or your file server. After importing them in in the InLoox options, they are available to all users on the project platform. Click on Download to load and use pre-made templates from the InLoox website. When you are done editing your task templates, click on OK in the Options dialog. The changes now apply to the entire project platform. Open the InLoox options by clicking on the File tab in the upper left corner, then on the InLoox options in the navigation pane on the left. In the InLoox options, click in the navigation pane on the left on General Options, More Options. On the bottom right, you can set the update interval in InLoox in minutes for the entire project platform. 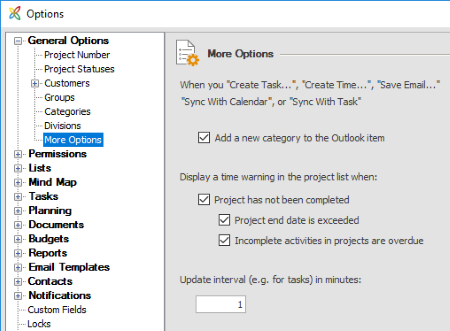 Task settings in InLoox 9 for Outlook • Copyright 1999-2019 © InLoox, Inc. All rights reserved.